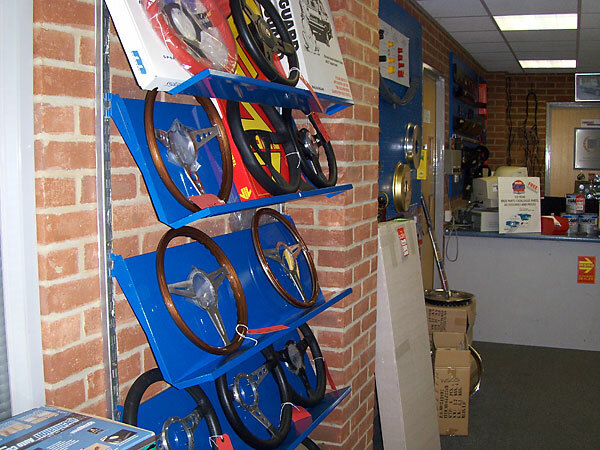 In the last issue of the Newsletter, Curtis wrote about visiting Abingdon and also the British Motor Heritage facility at Witney. 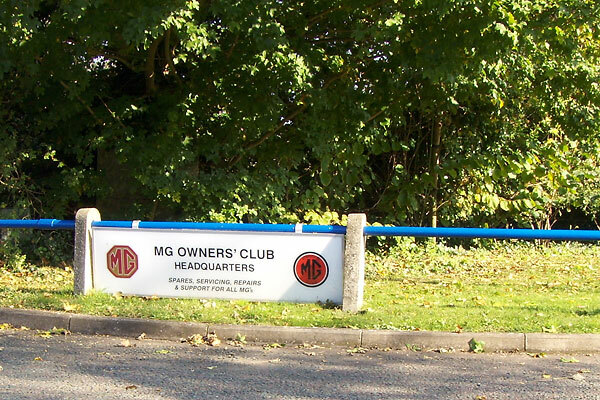 In late October I was planning a business trip of my own to England, and Curtis suggested I might enjoy visiting the MG Owners' Club (MGOC) headquarters in Cambridge. I contacted Richard Ladds, who is Editor of the MGOC magazine. He was more than happy to have a visitor from the British V8 community. When he realized he'd be away on holiday during my visit, Richard arranged for MGOC General Manager Richard Monk to be my host. With my business schedule, I only had about a half day free. Nonetheless, I had a great visit! I only wish there had been more time to visit and explore. I arrived in the UK at Gatwick airport, which is one of the two major London airports and is due south of the city. (The other airport is Heathrow, which is to the west.) Cambridge, on the other hand, is due north. The drive to Cambridge was both easy and scenic. It took about two hours, starting with the beltway around London and continuing up the M11 motorway north through countryside, woodlands and farms, and past some charming small towns. I arrived a bit early, so I drove around the famous University of Cambridge and enjoyed its awesome architecture. There are also great museums and plenty of other points of interest. If my wife had been with me we'd certainly have enjoyed spending a few days in Cambridge, and dining in some of the many quaint restaurants on quiet side streets. The MGOC - and their magazine "Enjoying MG" - now embrace V8 conversions. Enjoying MG is a full color magazine. It's roughly a 90 page publication and it's packed with information. There are articles to suite any MG enthusiast. The October issue, for example, had a great article about a recent track day event; another article celebrating the 50th anniversary of EX181 (a special MG that set a Bonneville salt-flats speed record in 1957); a detailed historical piece about the MG Midget production line; and another covering the restoration of a '73 MGB (in Portugal). But for me the most interesting article in the October issue was about a V8 swap project, complete with pictures of the motor mounts being welded in and the "bulkhead" (firewall) being modified around the steering u-joint. In other words, their own version of a "How It Was Done" article! 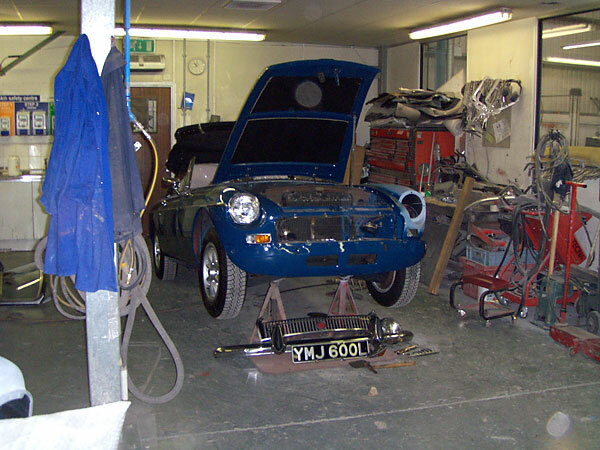 The MGOC repair and restoration facility, like the headquarters building, is relatively small: there were three lifts and room for about 5 cars to be worked on at any given point. The paint and body room could handle one or two cars at a time. I didn't get to chat with any of the mechanics, but I was impressed by the expertise they have in diagnosing and repairing anything MG. Few places in the world have that sort of singular focus and such depth of experience. 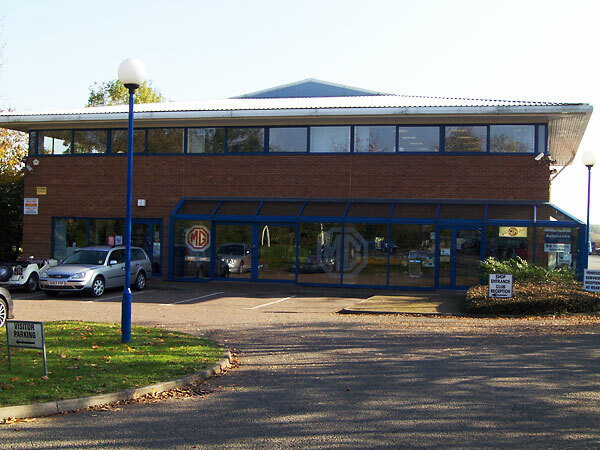 The MGOC parts business shouldn't be overlooked by North American MG enthusiasts. MGOC bought up much of the original MG tooling, and therefore they have the service parts that fit right. They have also updated parts where that made sense. Many of these parts are directly applicable to our hobby: performance modifications! 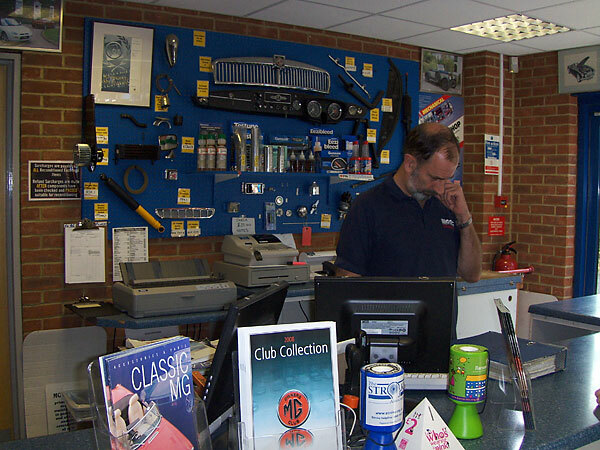 The MGOC retail sales desk serves walk-in customers. Wood & leather steering wheels, and hubs to make them fit! MGB front crossmembers with modifications for power steering. Momo wood & leather steering wheels, and the hubs to make them fit! Regretably, my camera was acting up terribly. Most of the photos I took aren't downloadable. 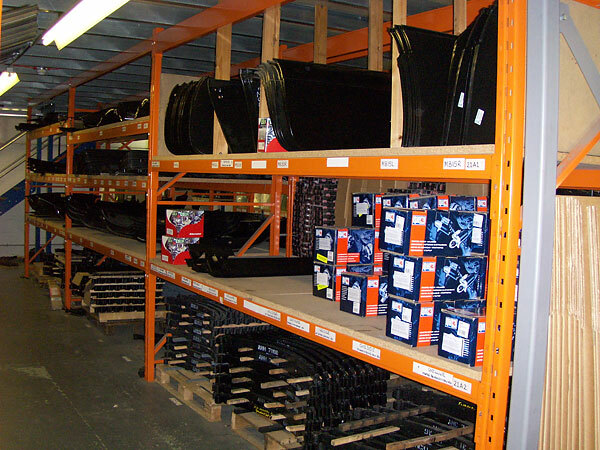 Over 95 percent of MG parts are still available. 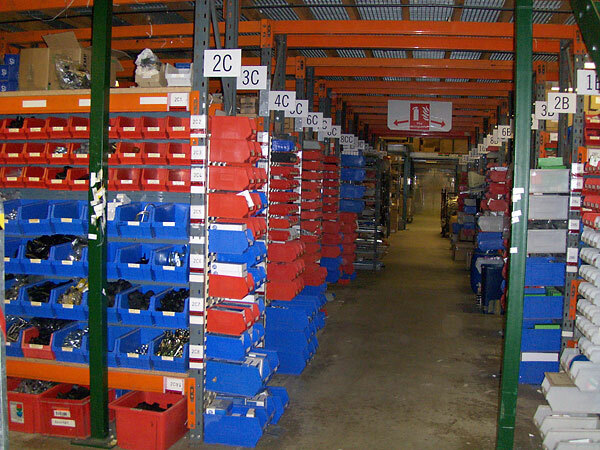 MGOC keeps 17,000 different MG parts in service. There were a ton of other parts to drool over too. Talking with Richard, I learned that MGOC provides about 95 percent of the parts an MG owner could want - and about 17,000 different part numbers! 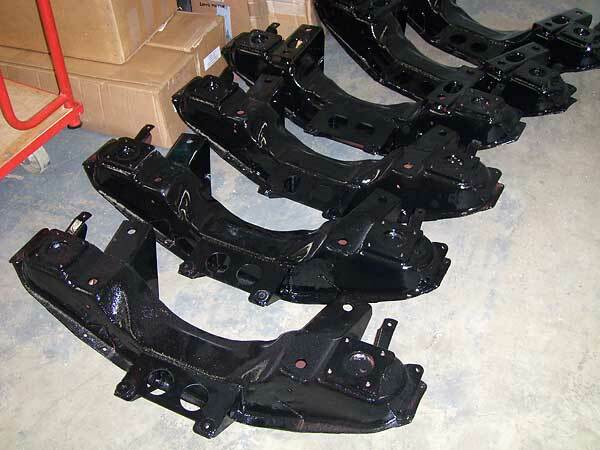 Very few MGB parts are on their "No Longer Available" list. With 2.5 million pounds sterling in-inventory (i.e. about $5.0 million $US), they most likely have the parts you're after in stock. 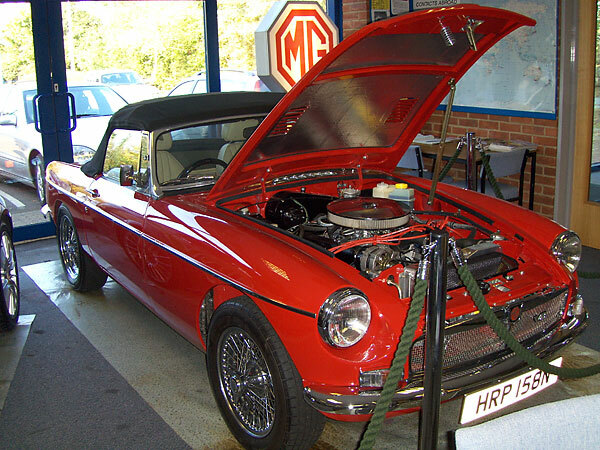 North American MG enthusiasts are a steadily growing segment of MGOC's customer base, apparently because more and more customers are now comfortable with purchasing restoration and repair parts online. MGOC's insurance company isn't licensed to do business in the US or Canada, but while talking about it, Richard did share that the MGOC has about 40k members worldwide. The vast majority, about 37k, are in the UK. About 900 are in the USA, and the remainder is spread around the rest of Europe along with a few members in other countries. 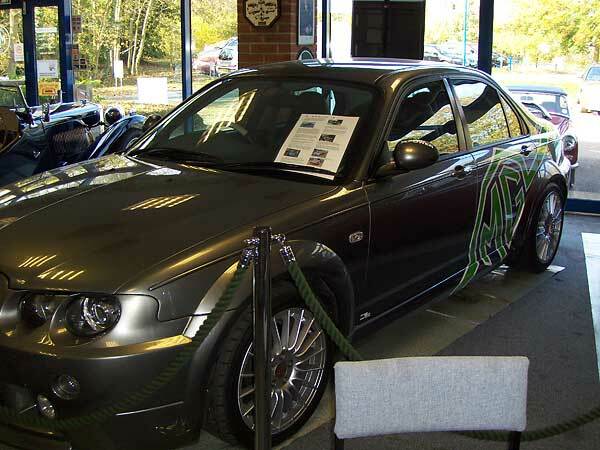 In 2001 this "MG ZT XPower 500" show car was built with a 500hp Ford 4.6L V8. "MG Rover Group" was bought by state-owned Chinese automaker "Nanjing Automobile Corporation" in 2005. We also chatted about Nanjing Automobile Corporation. The MGOC has a very pragmatic view of Nanjing's purchase of The MG Rover Group (and reintroduction of the MG ZT and TF models, etc. ), believing it will breath new life into the marque. 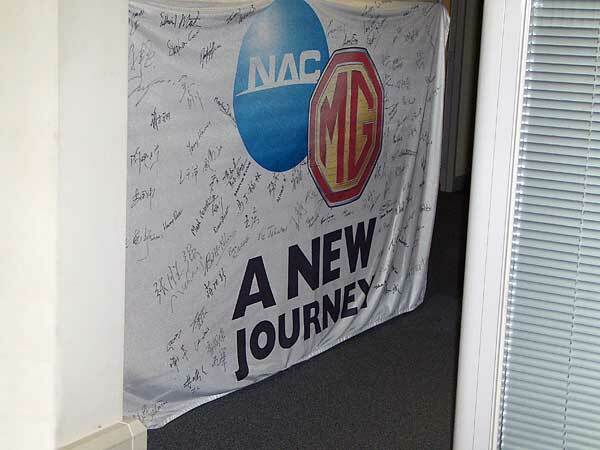 They hope that reintroduction of the MG brand will renew interest in restoring and enjoying classic MG's, both by generations that grew up with them and also by people who are too young to know about our cars. Nanjing recognizes that the MGOC can be a tremendous asset to them as well; they've met with MGOC employees on several occasions and have had members of the MGOC headquarters participate in reestablishing the marque in Britain. 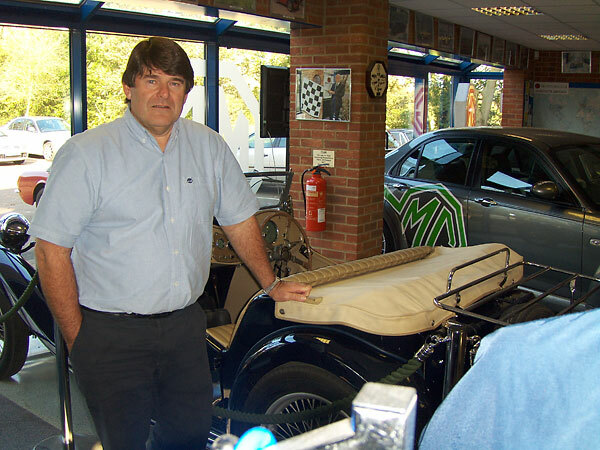 I'd like to thank Richard Monk for spending several extremely informative hours educating me about the MGOC. I'd also like to thank Richard Ladds for arranging my visit. 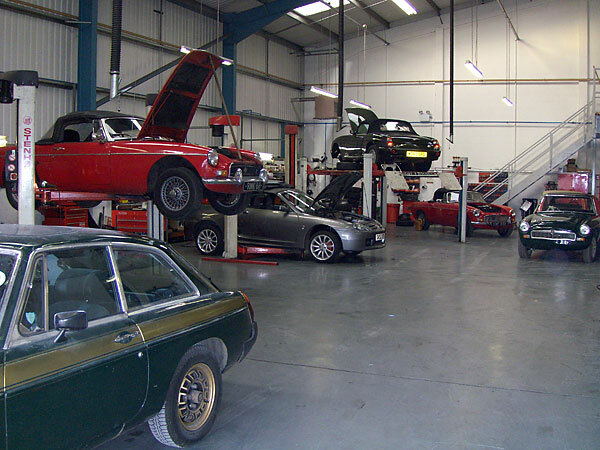 If you get the chance to go to the UK, the MGOC Headquarters should definitely be one of your stops. 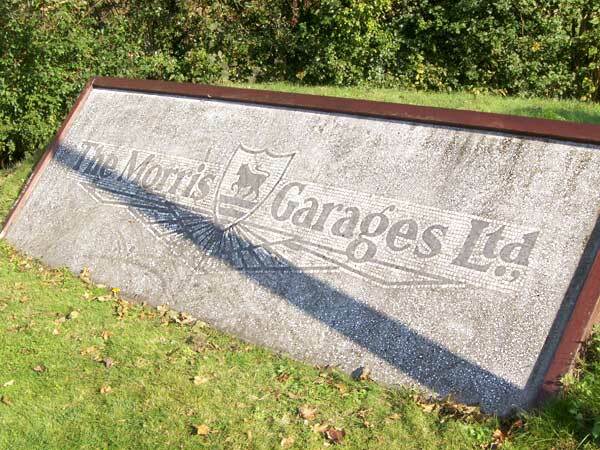 MGOC acquired this from a rubbish pile after the building was demolished in the 1970s.